I’ve already written about Bang Bang a couple of times on this blog, so I sort of figured I wouldn’t be writing about it again. I mean, I could happily make this blog all Bang Bang all the time — it’s the greatest, and anyone who says otherwise is dead to me — but that might get a bit monotonous. But… hey, this new flavour at Bang Bang, it’s also delicious! The roasted pineapple flavour at Bang Bang is so good that I have to post about it. I must. It’s too good. 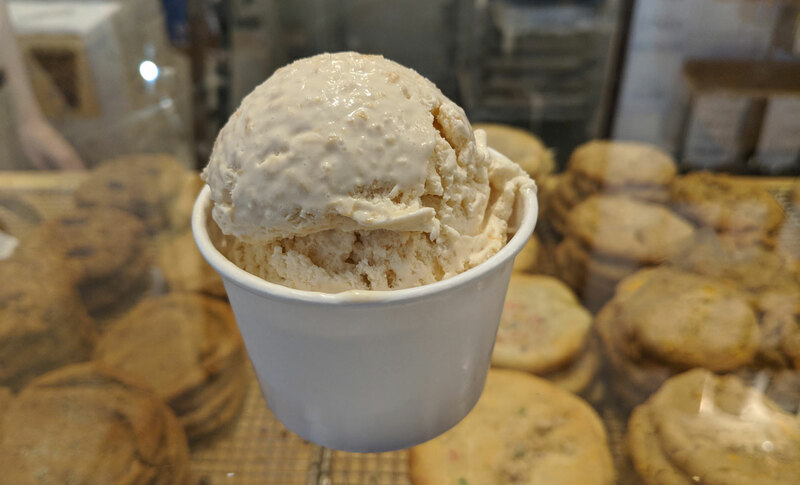 It’s got the usual creamy, rich amazingness that you expect from Bang Bang’s ice cream, but it’s the flavour that really puts it over the top into crazy good territory. I normally don’t even like fruity ice cream all that much, but this one is something special. It has such an amazing roasty pineapple flavour; it’s obvious that the fruit has been intensely caramelized. If you’re looking for something light and tart and refreshing, look elsewhere. This has a really deep, rich flavour that’s perfectly balanced by the creamy ice cream. It’s perfect. It’s honestly one of the best scoops I’ve ever had.